Have you guys seen the new Dries?!?! Could you die?!?! Could you pee all over yourself?!? Could you swim in those brocades until you literally suffocate?!?? That movement! That color! I don’t even really know what it IS and I don’t CARE! May Mother Earth bless me with the bravery and prodigious wealth to someday rock that blazer! Taken as a rich psychedelic whole, the collection operates like a dreamy, ever-morphing butterfly of Cool. Individually, though, it’s less about the perfect wearable fit, more focused on grabby jewel-tones, high sheen, and strong single-tone patterns. Where feminine tailoring tries to take center stage, it’s subtly undercut by broad, stocky layers. And are these shoes not the bees knees?!? 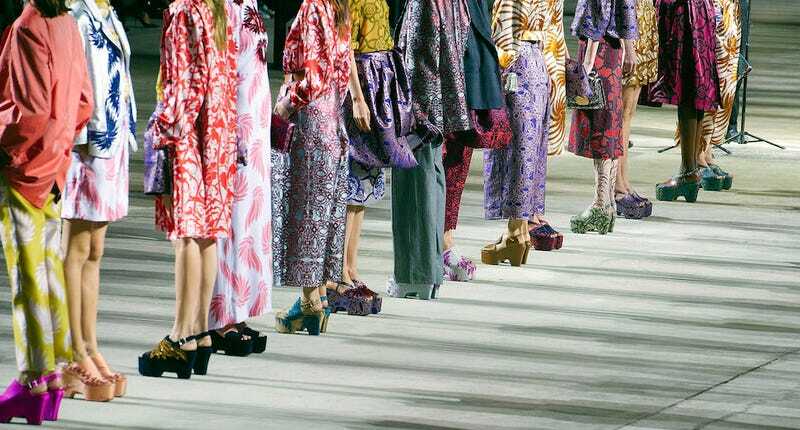 Sure, yes, some of the models are drowning in baggy patterns. But doesn’t it kind of look like the best game of dress-up you ever played? CAN YOU FEEL THE WEIGHT OF THE SILK CARESSING YOUR SKIN?? And do you know what, the far-right look, above, is one of the most flattering and simultaneously badass ensembles I’ve seen on the runway yet. Some of the looks are lighter, more studiously summery, but still maintain a firm grasp on the boldness and intensity that lives at the root of these designs. For a second there, enveloped in the smoky embrace of FASHION, I completely forgot that winter is encroaching! I’ve totally dissociated! Let’s all put on silk platforms and catch a jet to Majorca!